Islamist newspaper Yeni Şafak has called for Turkey to shut down the professional association representing 80 percent of the country’s doctors after it opposed the country’s armed intervention into Afrin in Syria. 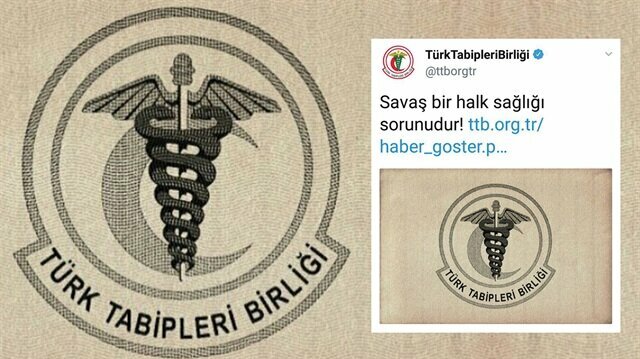 In an article entitled “Close this Association”, the newspaper pointed out that the Health Ministry and a smaller medical union had both condemned the statement by the Turkish Medical Association (TTB). “While Operation Olive Branch, being carried out in Afrin by the Turkish Armed Forces as part of the fight against terror continues, the reactions to the scandal statements by terror-lovers continue,” the newspaper said. The Health Ministry condemned the TTB and called for its central committee to resign and apologise to society for its “non-national” statement, the newspaper said. Conservative rival professional association Sağlık-Sen filed for the Turkish Medical Association to be charged with applauding a crime, hate speech and harming the unity of the state and the wholeness of the nation. Prosecutors responded by opening an investigation against the TTB. BugÃ¼ne kadar Ã§ok defa terÃ¶r Ã¶rgÃ¼tÃ¼ PKKâya destek veren aÃ§Ä±klamalar yapan TÃ¼rk Tabipler BirliÄi Åimdi de Afrinâe yÃ¶nelik harekatÄ± hedef aldÄ±. TerÃ¶ristlere yÃ¶nelik operasyonu âsavaÅâ olarak niteleyen birliÄe tepki gÃ¶sterenler derneÄin kapatÄ±lmasÄ±nÄ± istedi. Ä°l SaÄlÄ±k MÃ¼dÃ¼rlÃ¼ÄÃ¼, âTÃ¼rk milletinden Ã¶zÃ¼r dilenmeliâ aÃ§Ä±klamasÄ± yaptÄ±. SaÄlÄ±k Sen ise dernek hakkÄ±nda suÃ§ duyurusunda bulundu.